In 1961, Ram Kumar was in Ranikhet for six months and painted landscapes. What makes this work exceptionally unique is how both the figurative blends in with the abstract in one image titled, "Mazes of the Mind". The reference to the word 'mazes' has been made by Richard Bartholomew, in The Art Critic, pg. 135 which is explained further in another essay in the same book, ‘The Abstract Principle in the Paintings of Ram Kumar’ on pg. 538. Bartholomew states, “The themes are not people or mountains or streets or trees or rivers or mudbanks. Large themes, the paintings are bird eye views of large tracts of nature. Things are seen from a height, and from a great distance. Hence the element of mist and of mazes. Amongst all these mazes are the remnants of some mystical figurative forms, but the people have disappeared in their entirety." 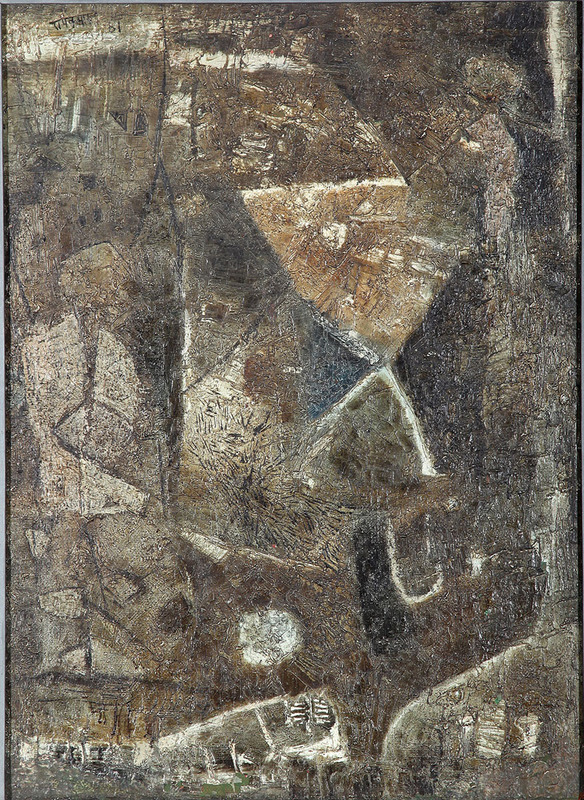 This oil on board double-sided work has been signed and dated as 1960 on the figurative side and dated as 1961 on the abstract side. Presumably, Ram Kumar completed it one after the other. This was right before his trip to Benaras for the first time with fellow artist M F Husain and Sripat Rai. 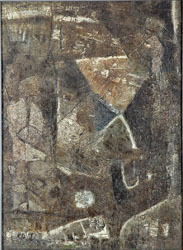 Therefore this work is special as it formulates a transitory phase in the artist’s journey from figurative to abstract. Inspired by his time spent in Shimla as child, his landscapes are bare and lonely, depicting isolation and fragility of the artist. The illusion of time and solitude is considered to naturally given; not as human deprivation but as a state of being. Ram Kumar could take apart this and separate the sense of being lonely and being alone. He played with the idea of absence; an absence that had meaning. 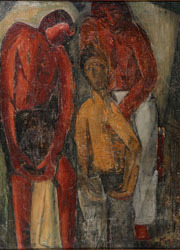 The figurative side, comprising of three figures is equally interesting. Here the two adult figures are clearly nurturing the child empathetically. The gesture of the hand suggests protection; a tender quality of compassion and the positioning of the figure in yellow indicates age. The brown and reddish colours used are typical for Ram Kumar for his figures. This brought about a social predicament in the way that he rendered his figures like primitive drawings with naive expressions.